Jim Willshire of Endell Veterinary Group, Salisbury, explains why it is important to use the right antibiotic product, via the right route and to follow the right course of treatment. IN 2016 the World Health Organisation (WHO) reprioritised the importance of all the antibiotics previously considered as ‘critically important’ (that resistance is not allowed to develop) into three new categories. Since then, those deemed to be the highest priority critically important antimicrobials (HP-CIAs) in the medical sector are now specifically reserved for use in humans only as a second line treatment where the bacteria’s sensitivity has been demonstrated. However, in the livestock sector, there has not been the same categorisation of antibiotic importance, and farming references to critically important antimicrobials (CIAs) are the WHO’s new HP-CIAs. Nor has there been any official limits put on vets prescribing antibiotics from any of the WHO’s categories. However, some supermarkets and milk buyers have stipulated their livestock suppliers avoid use of the HP-CIAs. Some farmers and vets have also voluntarily decided to adopt the same policy. Responsible use is about questioning the routine use of these antibiotics. So, if using an HP-CIA product, ask whether it can be traded for an alternative which is less ‘important’. The HP-CIA product can then be held in reserve for second or third line treatment if the first option fails. Different antibiotics are effective against different types of bacteria. It is not appropriate to use any antibiotic for an infection, just because there happens to be a bottle already on the shelf/in the fridge. Farmers and vets have a wide variety of diagnostic tools which can be used to identify the type of bacteria causing an infection. These include milk bacteriology testing for mastitis pathogens and conducting post-mortems to identify causes of pneumonia. Greater use of diagnostics will enable better choices of antibiotic product to be selected. Antibiotic products are licensed for certain bacteria under certain conditions and need to be administered at an appropriate concentration and route as prescribed by the vet. If there is not a licensed product available for the specific case, then vets use a ‘cascade’ system to identify the best alternative, combined with their experiences and expertise. However, bacterial populations can change over time and while a farm’s mastitis may have been due to environmental bacteria in the past (e.g. E.coli), sometimes contagious bacteria (e.g. Staph. aureus) can enter the system and product choice needs to be reassessed. So, if an antibiotic starts failing, contact your vet so investigations into the cause can be made. Do not just use the same antibiotic because you have always done so. Is it time to review your medicine usage with your vet? 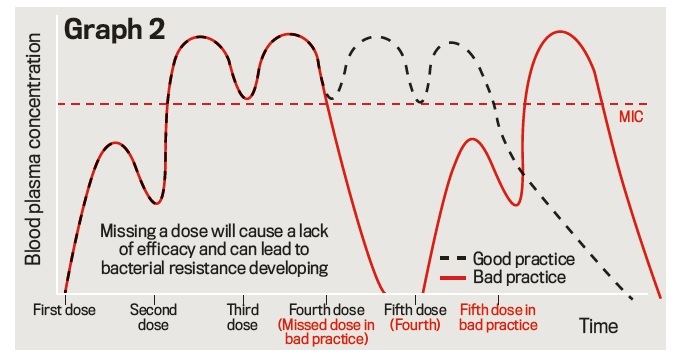 Antibiotic treatments may be administered by topical/local application close to the target site, e.g. intramammary tubes, or systemically, i.e. injections. The downside of systemic treatments is they rely on the antibiotic entering the bloodstream and this exposes not just the target bacteria but it may also kill other susceptible bacteria. These are the ‘innocent bystanders’, some of which are ‘good’ bacteria which have a protective role blocking the ‘bad’ bacteria. Not all infections can be reached by topical treatments but, given the option, this is the more ‘responsible’ route. When using systemic treatments, injection routes may be intravenous, subcutaneous or intramuscular. Why the different options? Because the companies which developed these products considered the easiest route for administration and then conducted efficacy trials to formulate their products based on their chosen route. So it is important to read the label and administer the antibiotic as instructed or else efficacy cannot be certain. An antibiotic’s activity may be either concentration-dependent or time-dependent and this dictates the treatment course which is prescribed. 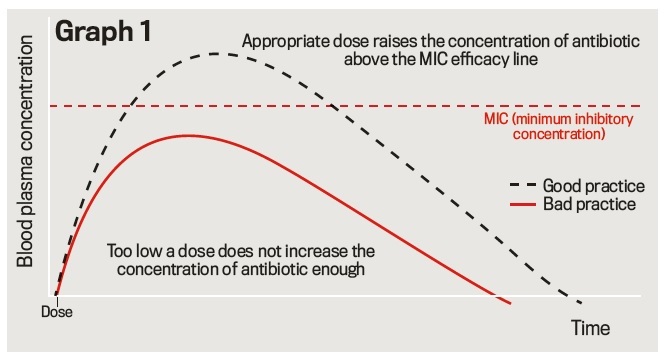 The efficacy of concentration-dependent antibiotics relies on achieving a required peak concentration, which needs to be above the MIC (minimum inhibitory concentration). These are the one-shot products favoured for their convenience and include products containing fluoroquinolones and macrolides. Their efficacy depends on the total number of antibiotic molecules which reach the bacteria. So products are focused on giving enough to get a surge in the blood plasma levels and this saturates the target receptors on the bacteria. But failure to achieve a bacteriological cure will occur when the animal’s weight is underestimated, or the full dose is not given. 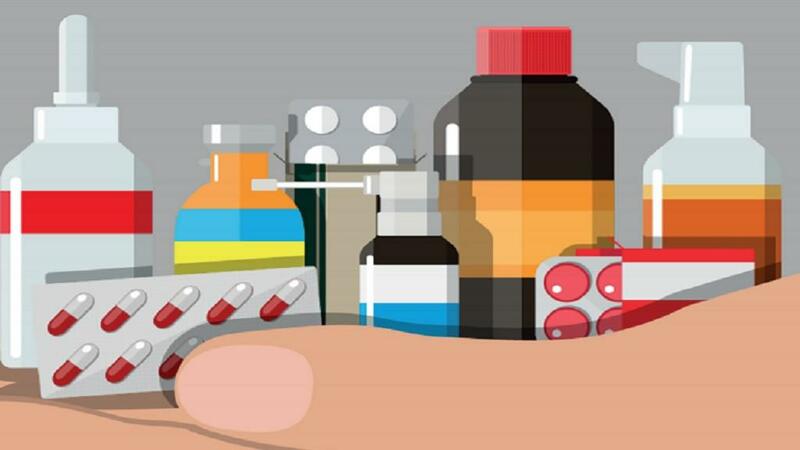 For time-dependent antibiotics, it is not only important to finish the course but also to ‘follow the course’ and give every dose regularly, as prescribed. For efficacy, these products are focused on the period of time the antibiotic concentrations are above the MIC. Figures 3 and 4 illustrate examples of good and bad practice. Figure 4 shows how missing a dose out results in an under-dosing of the animal, giving two opportunities for bacteria of a more resistant genotype to multiply up. Penicillins and cephalosporins are time-dependent antibiotics. The length of any course will depend on the infection site as some targets/organs will have a better blood supply to them than others. Also, infection levels will vary and some antibiotics need more time to target the receptors in the bacteria. Vets take all this into account when prescribing treatment courses. 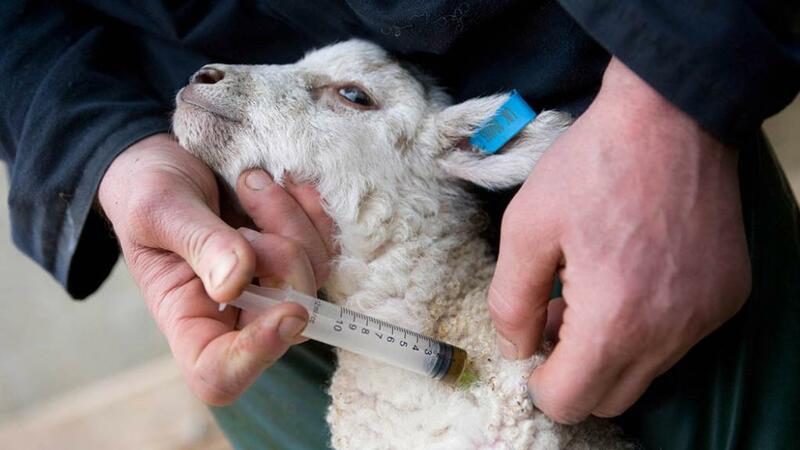 For both types of antibiotic, failure to administer an appropriate dose or follow the full course can result in the infection appearing to have been cured, only to flare up again. This is because a clinical cure was achieved but not the required bacteriological cure. Depending on the animal’s immunity and environmental conditions, it may self-cure or it may succumb to a recurrence of the infection. In the latter case, changing to an antibiotic with a different mode of action is sometimes required. Involving your vet is key. Some changes can happen quickly while others will need to be ongoing. Refine farm practices. Have a six-monthly, or at least annual, review with your vet to look at the outcome of any changes made. Is it possible to further reduce antibiotic use now? Or do protocols need tweaking?